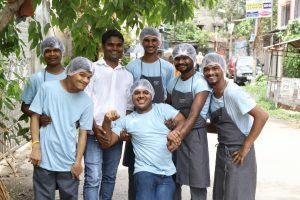 The bakery was established in 2013 and is currently run by Raju Das, Bapi Das, Ashok Chhetri, Sanjay Sarkar, Pinku Das and Suman Goswami -all aged between 20 and 30 and inmates of an NGO's residential training centre for differently abled street kids. "Raju, Ashok, Pinku and Sanjay are the oldest employees of the bakery; Bapi joined a bit later and Suman has joined recently . They are given responsibilities in accordance with their abilities and no one is pressurised to do anything; they work at their own pace," said Somnath Sardar, the manager of Shuktara Cakes, who joined the team three and a half years ago. And it's quite a team. While Sanjay looks after the outdoor work, Pinku, Bapi and Raju take care of the baking and mixing and Ashok and Suman manage the packaging and cleaning. Nagendra Mishra, the chairman of the NGO that brought the boys up, told us that the bakery was the brainchild of French restaurateur Alain Cojean and pastry chef Fabien Rouillard. He said the latter also trained the boys to bake French specialties. "In just 10 weeks, the boys transformed into amazing bakers! We feel so proud of them. Now we deliver cakes to different cafes and also take special orders. But we deliver only on against advance booking, as we don't want to put too much pressure on the boys," he added. All the boys are paid salaries in accordance with the importance of their duties and responsibilities.They work between five and six hours every day . "In summer, they work for five hours, as the number of orders is less. They get to work at 8 am sharp and continue till noon or 1 pm. But in winter, especially ahead of Christmas, business picks up and the boys have to work a bit more to meet the increased demand," Somnath told us. Speaking about the hiccups they had while setting up the bakery, Nagendra told us that the original plan was to set up a cafe. "But we had to step back because of various logistical issues. Moreover, when we opened the bakery , a number of five-star hotels and established hoteliers promised help, but all of them backed out later. Then we thought of delivering cakes against advance orders and thankfully , we now have twothree permanent clients along with party and event orders," he said. "The growth is slow and we're still not making profits, but the smiles on the faces of the boys keep us going. Sanjay is now married and lives in a rented house with his family . We also want the same to happen with the other boys," Nagendra added. He has been deaf since birth and became an inmate of the home when he was 10. Pinku, who loves maths and drawing architectural designs, is known to be the most dependable member of the team. And when he's not baking, he can spend an entire day watching cartoons. The self-proclaimed naughtiest of the lot, Ashok was brought to the home in 2003 by an Irish nurse working in a mental asylum in Kolkata. He was wrongly diagnosed for a good part of his early years and is actually a victim of cerebral palsy.And although he has limited mobility, it doesn't stop him from going about life with vigour. In fact, the intelligent and fiercely independent boy refuses help of any kind and pity angers him.He can't speak, but can use sign language and understands English, Hindi and Bengali. He was just 10 when he was brought to the home. And now, Suman works at the bakery and looks after the packaging station as he's physically challenged and needs help to move around. Known for his soft and polite nature, Suman is an effective worker at the bakery. Born on a pavement near Kalighat, Raju's grandmother took care of him after his mother passed away and father abandoned them. He has cerebral palsy and severe disability in both legs. As a child, he would crawl under cars and onto the street, endangering his life. When brought to the NGO's home, he could not walk or talk.But now, after completing his preliminary studies, he's doing extremely well at the bakery, despite his handicap. He was brought to the NGO at the age of nine in April 2000 and no one knows anything about his background or family. Sanjay, who is deaf and communicates using sign language, has always wanted to have a family of his own. And in 2015, his wish became true when he married Munni. The couple now has a girl, Sumi. He's the laadla of the group, as he's a very matured and amicable despite having a severe hearing impairment. He was brought to the home as a child after the workers of an NGO found him moving around Howrah station.He can now communicate effectively using sign language, is good in studies and really proficient in using computers.